Very seldom does Maruti Suzuki want to put the past behind, given it's overall leadership position in the market. 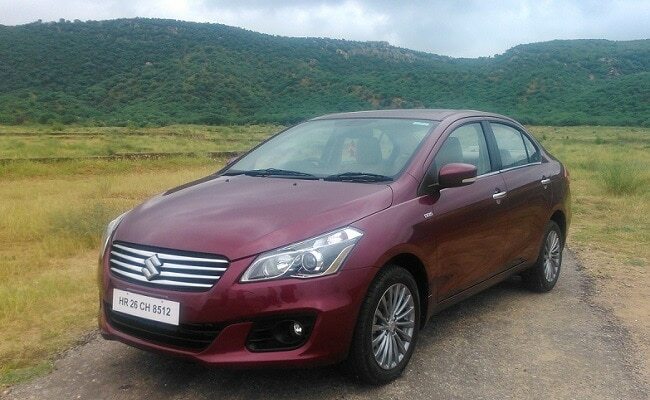 However, the compact sedan segment has proved to be a tough nut to crack for Maruti - the initial response to the SX4 was great, which then flagged off when the DZire arrived. 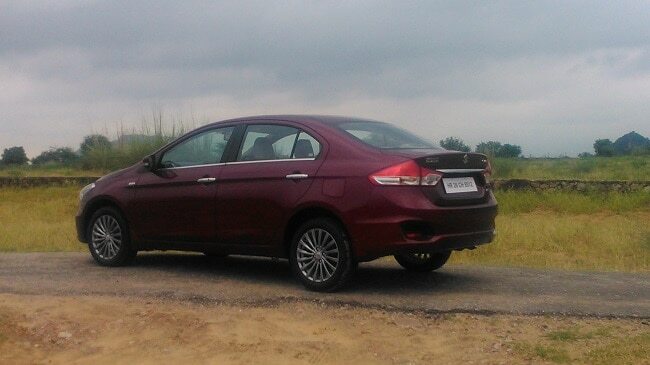 So the new Ciaz is better-equipped and built on an all-new platform, unlike the SX4 whose styling looked quite dated. 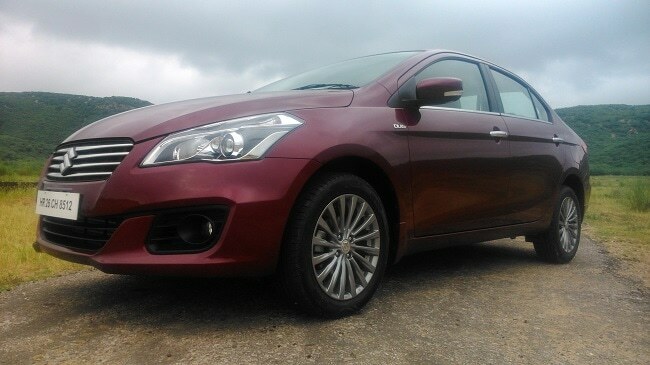 Compared the City or Verna, the Ciaz's design is safe, and yet attractive. The front fascia comprises of a fairly large hood and a 4-slat chrome grille with the Suzuki 'S' badge in the centre. Also, the large projector head-lamps don't fail to grab your attention. The 16-inch alloys, which come only on the top-end Z+ variant, add to the appeal. 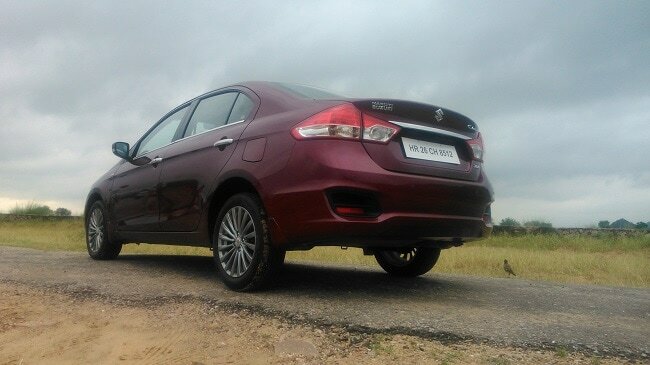 Now at one glance, especially from the side, you will realize just how big and wide the Ciaz is. So no points for guessing that this upcoming sedan has an impressive wheelbase on offer. Take a look at the relevant numbers of Ciaz's competition and you will see that Maruti's new sedan's 2650mm of wheelbase is substantially more than that of its rivals. That's not all, the sedan also gets a ground clearance of 170 mm, which is, again, more than that of its rivals. As far as its rear is concerned, it is hard to miss the striking similarity with the Honda City. Strange! The Ciaz has a roomy cabin and doesn't lack storage space either; you won't be complaining about the space in both, the front and the rear. Though the cabin isn't plush by any means, the beige-black interiors with wooden garnish and chrome surrounds on the dash do offer some premium appeal. The cabin also gets a lot of controls and switches carried over from the Swift. Now, for the overall quality of the material used inside the cabin, it is pretty impressive - especially for Maruti. The central console on the top-end Z+ variants comes with a SmartPlay infotaintment system with a large touchscreen. This unit from Bosch is equipped with voice recognition, navigation, integrated rear view camera and Bluetooth. Sadly, we faced some minor issues with the screen turning on and off in our test cars. Maruti might want to get that fixed before the sedan hits the market. In addition to the generous space, the car also gets several comfort-enhancing features, like rear AC vents, extra shade on the windscreen, and reading lamps among others. The leather seats are quite comfortable too, though they sit a tad bit low. The real highlight for me, however, is the fact that the seats also provide excellent thigh and shoulder support. The boot space is a generous 510-litres, which is same as the Honda City but more than the Hyundai Verna. 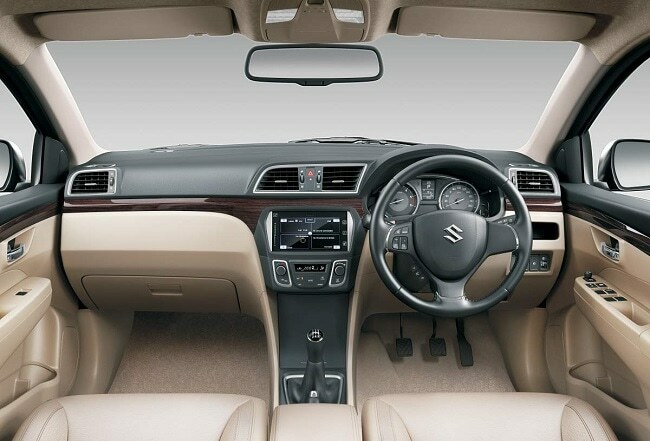 The Ciaz gets ABS with EBD mid-variant onwards, while dual airbags are available only on the top-end trims, with the mid-level trim offering only driver-side airbag. Ah, well! We expected a little more from Maruti in the safety department, so this is a big let-down. Now, business. We drove the 1.3-litre diesel variant, carried over from the Ertiga albeit a tweaked ECU and throttle. This engine comes mated to a 5-speed gearbox and puts out 89bhp along with a healthy 200Nm of torque. On the other hand, the new, upgraded 1.4-litre K-Series petrol motor has 91bhp on tap and 130Nm of torque. Maruti will offer two transmission options on this one, a 4-speed automatic and a 5-speed manual. Both of these engines claim class-leading fuel efficiency figures - especially the diesel motor, which is higher than that of the Honda City. So far so good, but we were only getting started and we soon came across the thing that failed to impress us - the lag in the diesel engine. First, the turbo takes its own sweet time to kick in, and fails to impress even after it does. Then there's the noise levels; it is very intrusive and the cabin is constantly buzzing. Anyway, the Ciaz glides over bumpy roads on the soft suspension setup, making it quite a comfortable drive, especially on low-speeds on city roads. That said, the ride tends to be, umm.. bouncy on uneven terrain at high-speeds. On the highway, the Ciaz fares well in terms handling and braking but the steering lacks the confidence to let you push it around corners. The overall package feels good, thanks to the attractive styling, spacious cabin and the new features. And well - it's a Maruti too! Expect the Ciaz to arrive in India by mid-October, smack in the middle of the festive season, accompanied by an aggressive price range of about Rs 7 - 11 lakhs.